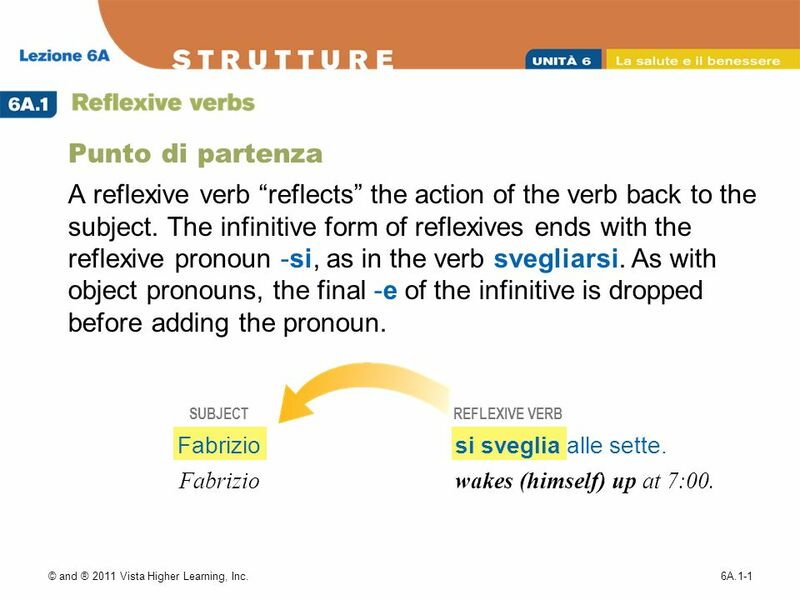 1 Punto di partenza A reflexive verb “reflects” the action of the verb back to the subject. 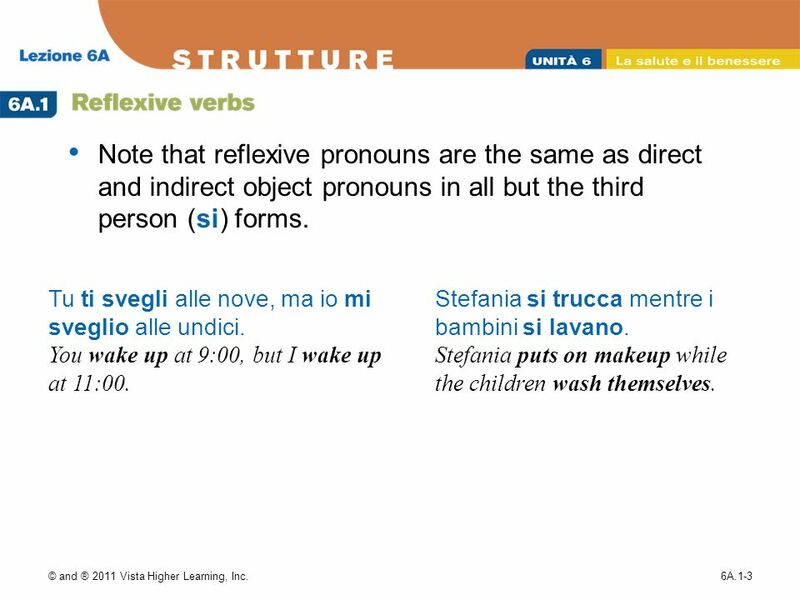 The infinitive form of reflexives ends with the reflexive pronoun -si, as in the verb svegliarsi. As with object pronouns, the final -e of the infinitive is dropped before adding the pronoun. 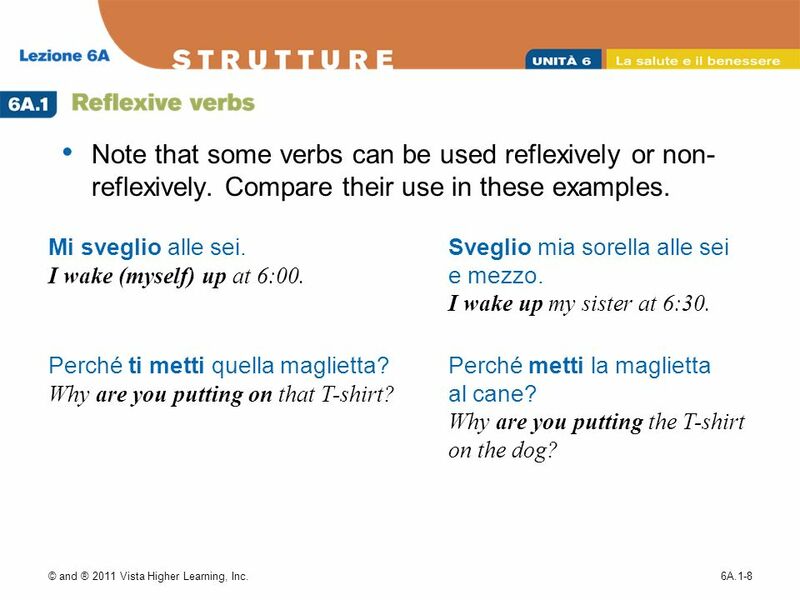 SUBJECT REFLEXIVE VERB Fabrizio si sveglia alle sette. wakes (himself) up at 7:00. © and ® 2011 Vista Higher Learning, Inc.
3 Note that reflexive pronouns are the same as direct and indirect object pronouns in all but the third person (si) forms. Tu ti svegli alle nove, ma io mi sveglio alle undici. You wake up at 9:00, but I wake up at 11:00. Stefania si trucca mentre i bambini si lavano. Stefania puts on makeup while the children wash themselves. 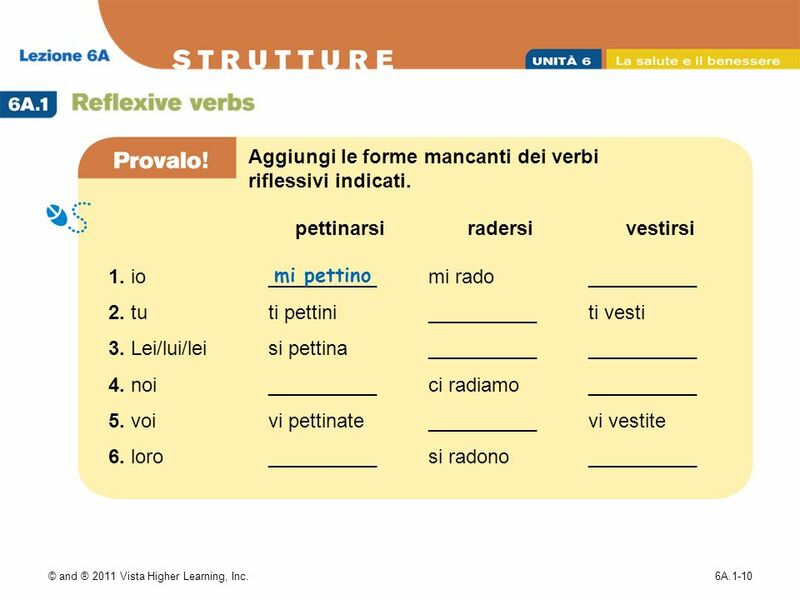 © and ® 2011 Vista Higher Learning, Inc.
4 Like other object pronouns, reflexive pronouns precede conjugated verb forms or are attached to the infinitive. 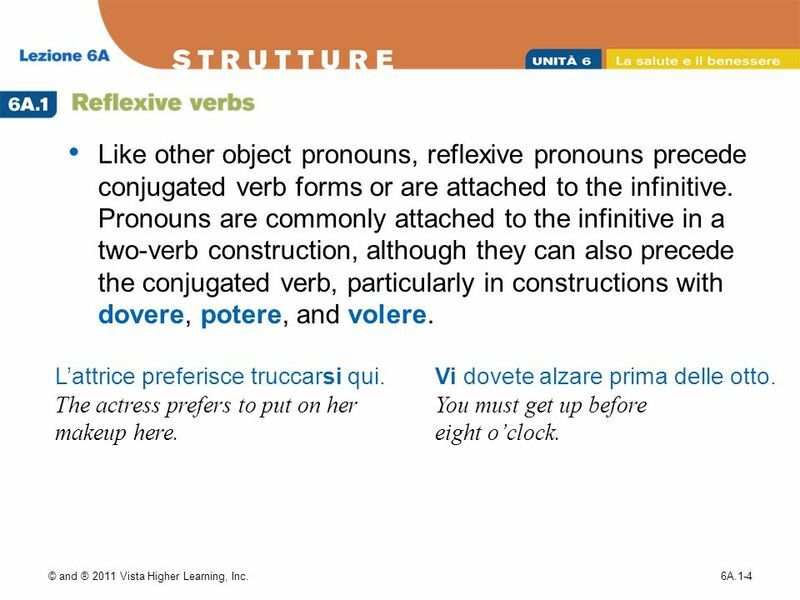 Pronouns are commonly attached to the infinitive in a two-verb construction, although they can also precede the conjugated verb, particularly in constructions with dovere, potere, and volere. L’attrice preferisce truccarsi qui. The actress prefers to put on her makeup here. Vi dovete alzare prima delle otto. You must get up before eight o’clock. 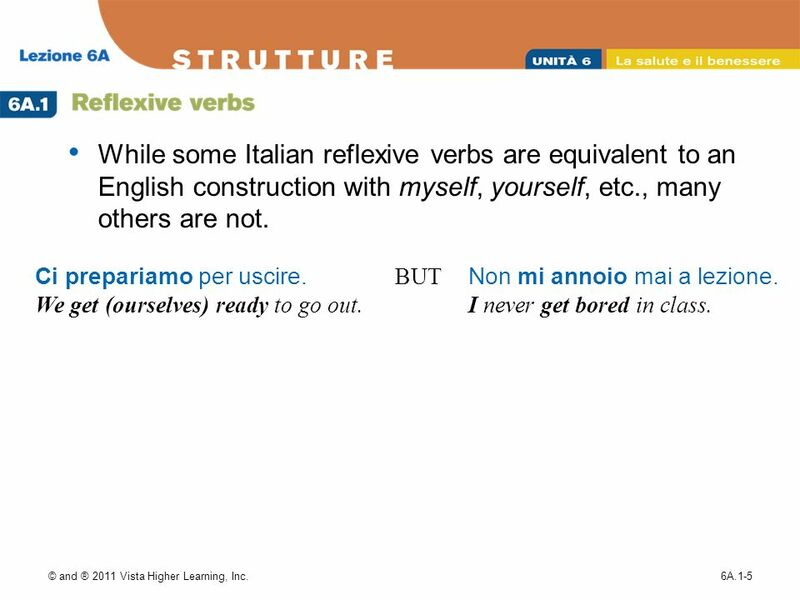 © and ® 2011 Vista Higher Learning, Inc.
5 While some Italian reflexive verbs are equivalent to an English construction with myself, yourself, etc., many others are not. Ci prepariamo per uscire. We get (ourselves) ready to go out. BUT Non mi annoio mai a lezione. I never get bored in class. © and ® 2011 Vista Higher Learning, Inc.
6 © and ® 2011 Vista Higher Learning, Inc.
Sedersi is irregular in all forms except noi and voi. The stem of the irregular forms is sied-. Non si siedono sulla panchina. They don’t sit on the bench. Dove vi sedete a tavola? Where do you sit at the table? © and ® 2011 Vista Higher Learning, Inc. 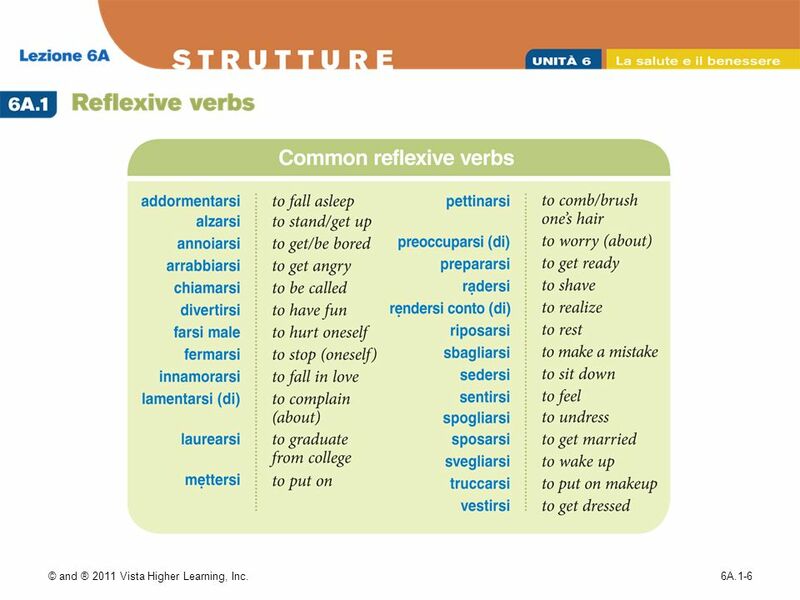 Note that some verbs can be used reflexively or non-reflexively. Compare their use in these examples. Mi sveglio alle sei. I wake (myself) up at 6:00. Sveglio mia sorella alle sei e mezzo. I wake up my sister at 6:30. Perché ti metti quella maglietta? Why are you putting on that T-shirt? Perché metti la maglietta al cane? Why are you putting the T-shirt on the dog? 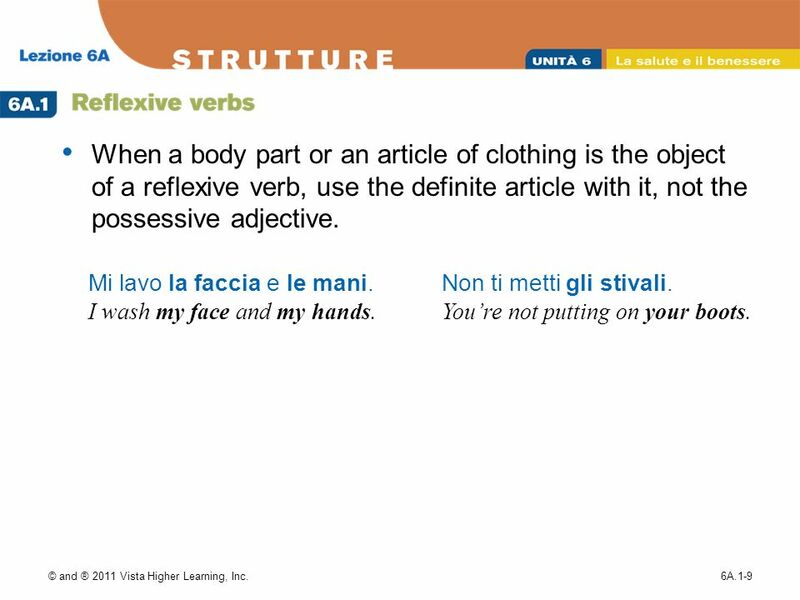 © and ® 2011 Vista Higher Learning, Inc.
9 When a body part or an article of clothing is the object of a reflexive verb, use the definite article with it, not the possessive adjective. Mi lavo la faccia e le mani. I wash my face and my hands. Non ti metti gli stivali. You’re not putting on your boots. © and ® 2011 Vista Higher Learning, Inc.
3. Lei/lui/lei 4. noi 5. voi 6. loro pettinarsi __________ ti pettini si pettina vi pettinate radersi mi rado ci radiamo si radono vestirsi ti vesti vi vestite mi pettino © and ® 2011 Vista Higher Learning, Inc.
Download ppt "Punto di partenza A reflexive verb “reflects” the action of the verb back to the subject. The infinitive form of reflexives ends with the reflexive pronoun." FORZA 2-CAPITOLO 5. 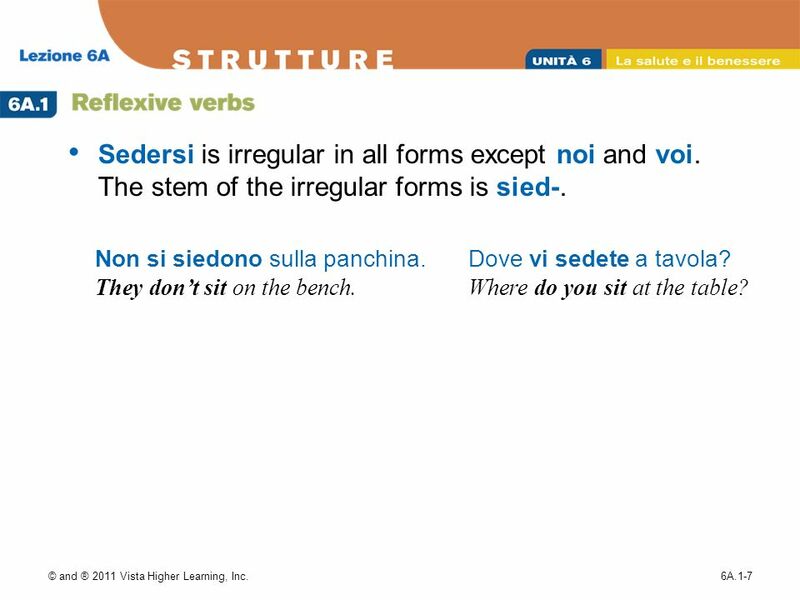 Pronomi Diretti  A direct object receives the action of a verb directly and answers the question what? or whom?  Direct objects.